When I read on the internet somewhere that this was one of the most popular items at Trader Joe’s, I knew I had to pick it up. Unfortunately, or fortunately as it turned out, I didn’t read the cooking directions first. This requires real cooking. And there’s no microwave easy way out! Well that turned out not to be the end of the world. What I got in return was some pretty good takeout quality sweet-sour chicken. And there was a lot of it, just like takeout. I chose to cook the prebreaded chicken pieces in oil rather than cooking them in the oven. That also gave me the opportunity to use my wok-like pot that I only use about once in a decade. The flat bottom on the pot works well on our electric stove. The chicken came out nice and crispy. The sauce came in two packets which gives you the option of only cooking half the chicken at a time, reserving the other half of the chicken and second sauce packet for another day. Unfortunately there’s only enough sauce to give the chicken a good coating. If you’re having rice as a side with this, there won’t be enough sauce to mix with the rice – if that’s your style. 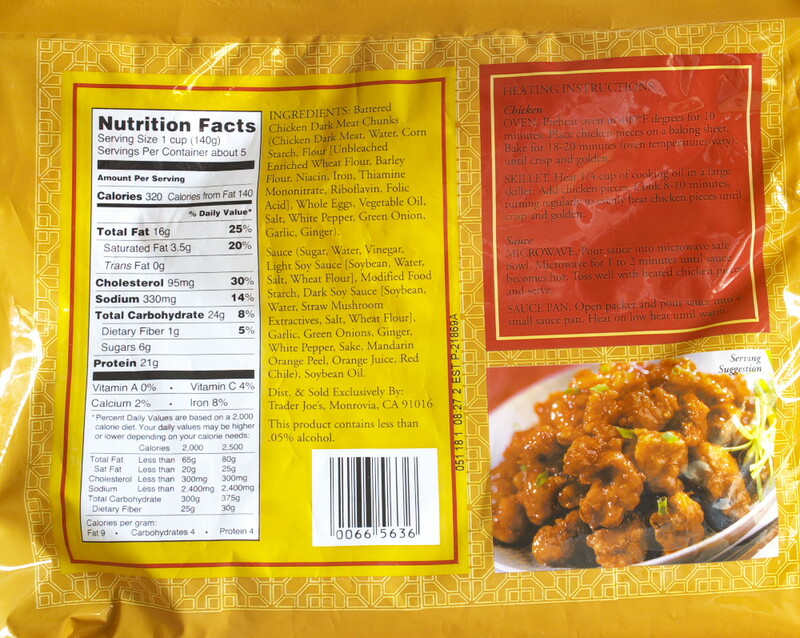 There are five suggested servings per package. Two people were able to finish off the whole package between them, which is much more realistic. The only problem with that would be the 800 calories that comes with eating half the chicken. It might be more prudent to add sides of rice and vegetables and have a smaller portion of chicken. That leaves the rest of the cooked chicken for leftovers the next day. That’s also just like takeout. 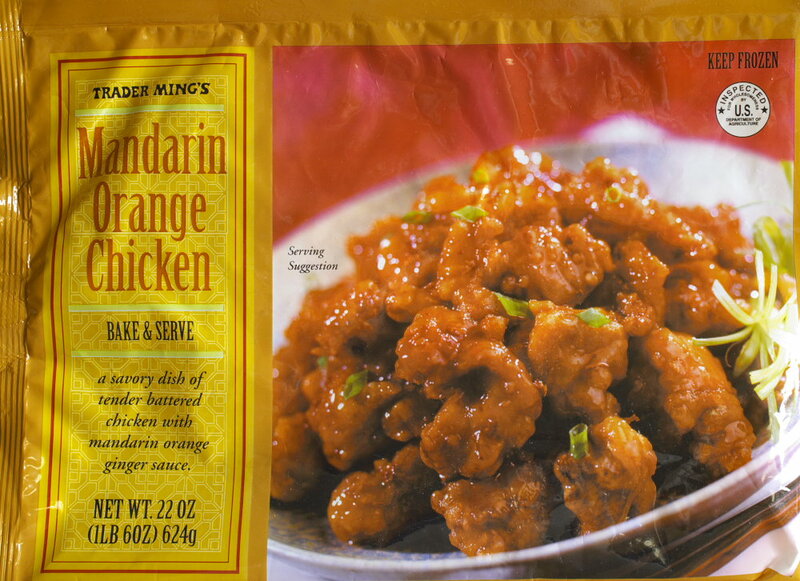 In the end this was some crispy chicken in a Mandarin Orange sweet-sour sauce which is very comparable to what you’ll get from your local takeout joint. This entry was posted on 06/14/2018 at 10:18 and is filed under Recipes, food, cooking and related items, Trader Joe's. You can follow any responses to this entry through the RSS 2.0 feed. You can leave a response, or trackback from your own site. This is one of my favorite items from Trader Joe’s (typically eat it once a month or so). Hard to beat the combo of value and taste! The tiny amount of leftovers also reheat really nicely, (a rarity for most reheated food). Surprisingly good. And I didn’t screw up the cooking part. Nice! I’ve found getting the oil nice and hot is key for crispy chicken (took a few times lol).